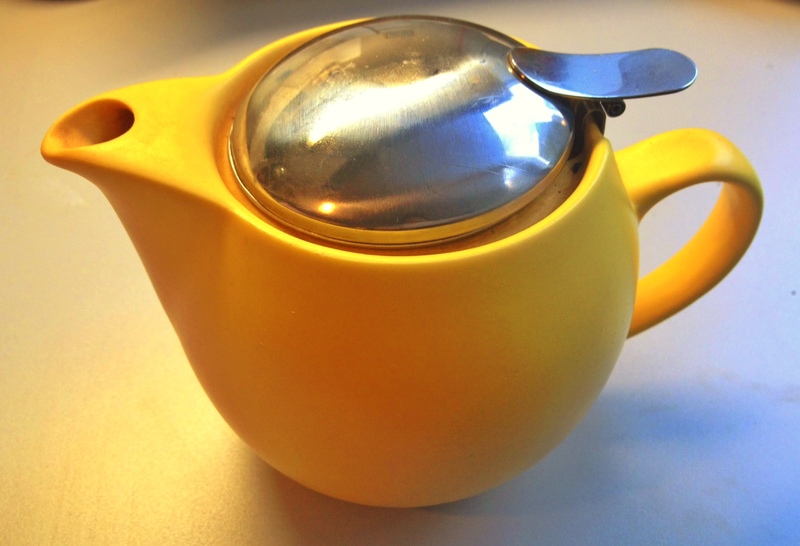 When I'm at work, I rely on my trusty yellow Bee House teapot. It's the perfect size, has a removable strainer and is very sturdy. I usually use filtered water that is heated through the water cooler or coffee machine for green and white teas, and actually heat water in the microwave until it boils for black tea. I've thought about getting an electric kettle for my desk, but I've been having a hard time choosing the right one. I want a variable temperature kettle so I can control the temperature, but most of them use plastic, and even the smallest bit that touches the water has BPA in it. I've seen a few electric kettles that are BPA free, but they just heat the water to boiling and don't have any other settings. If anyone knows of a variable kettle that does not contain any BPA, please leave a comment below! I'm on the hunt and would love your opinions. How do you steep tea in the office? Do you use a teapot, or paper filters, or teabags? Or are you lucky enough to work from home? I also drink tea in my office. Usually I love to drink herbal tea 2 and 3 times in a day. These types of herbal teas have been used people for their stimulant, relaxant or sedative properties.